Meanwhile, 200 miles to the south, the nation’s largest naval base – Naval Station Norfolk, home of the Atlantic fleet – was at risk of increased flooding. The base and the city of Norfolk are experiencing larger and more frequent floods these days as a result of their low elevation, natural ground subsidence, and rising sea levels attributed to global warming. 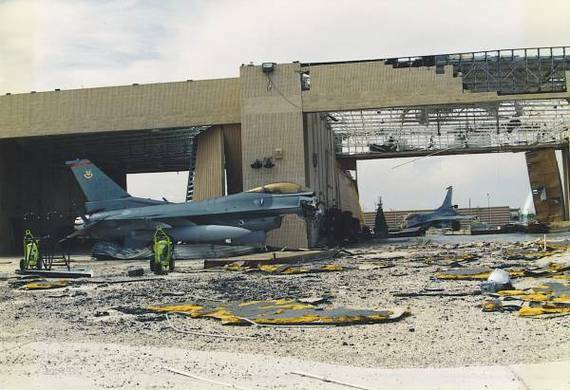 Homestead Air Force Base in 1992 after Hurricane Andrew hit Florida. Retired senior military and intelligence experts have sounded blunt warnings about the security risks of climate change for years. Similar warnings have been published by civilian organizations such as the Council on Foreign Relations, theCNA Military Advisory Board, and the Center for Climate and Security, a policy institute with an advisory board of senior retired military and national security experts.